In 2015, Task 48 – Quality Assurance & Support Measures for Solar Cooling – came to an end. One of the activities of this IEA Solar Heating & Cooling Programme task was the creation of PISTACHE, a tool for professionals who need to pre-size solar cooling, heating and domestic hot water installations and assess their estimated performance. As part of the Habisol programme, the development of the tool by French organisations Tecsol and INES during the MeGaPICS project received additional funding from the French National Research Agency. It is available as a free download in English and French on the website of Task 48. “Another main barrier we have identified in addition to cost has been the quality and reliability of solar cooling systems. PISTACHE can play a key role in making the technology easy to evaluate and give planners and investors something more definite to work with,” Amandine Le Denn, one of the developers of the tool, explained. 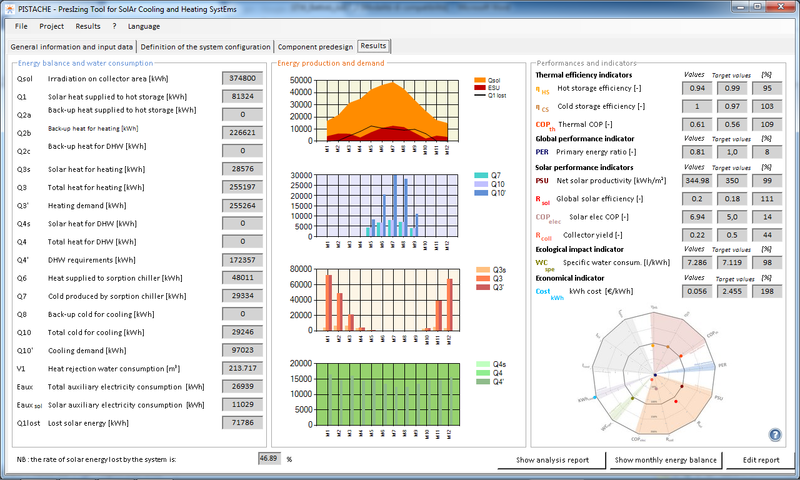 PISTACHE, which is available for Windows only, supports the user when pre-sizing an installation and shows an annual energy balance as well as some key performance indicators. “As far as I can recall, there hasn’t been another freely available tool which does such quick calculations and lets you include meteorological data from the Southern hemisphere as well,” Le Denn added. Thanks to a user-friendly interface, input files can be uploaded to the tool web page, where users can modify calculation parameters and choose the main component features. To receive an output file, the input one must contain hourly meteorological data for a year, cooling and heating loads and domestic hot water demand. The data must be in a text file and in a format that the tool can read, as specified in the step-by-step instructions in the help menu. Based on per-hour calculations, PISTACHE will show monthly and annual energy output and estimate yearly performance indicators, grouped into three different categories: thermal efficiency, overall performance and solar performance. On the tool’s first tab, users enter general project data. This includes a choice between pre-configured (packaged) and customised systems, meaning SolarCombiPlus installations and pre-designed solutions for small-scale use or tailor-made large-scale installations engineered and designed for specific applications, offices, etc. The former will have multi-energy storage (solar and backup), whereas the latter’s heat storage will be solar-only and the backup storage will be separately. On the same tab, users also enter the prices of conventional energy sources replaced by solar heat, so as to calculate the economic saving. The second tab is called Definition of the system configuration. It is used to select operation modes (cooling, heating and/or domestic hot water production), the cooling period and the backup system for heating and cooling. The backup solution for cooling supply could be either on the cold or hot side. Regarding heat demand, priority can be given to either space heating or domestic hot water production. The tab will then show automatically calculated load profiles and an installation diagram (see figure 1). 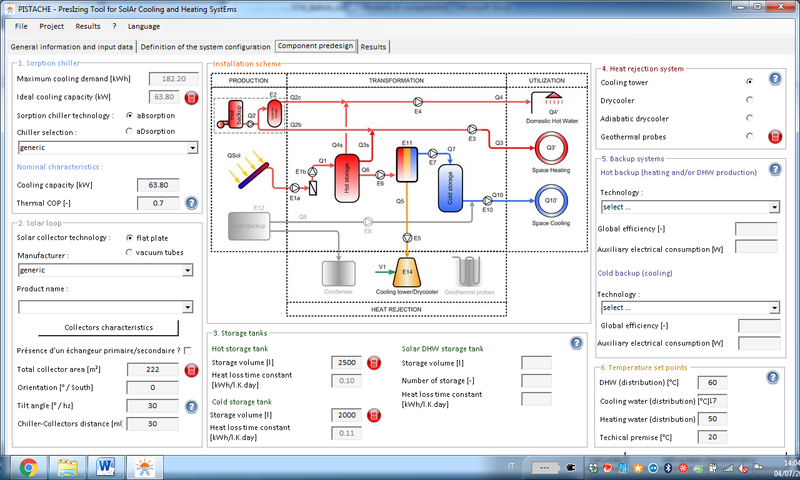 The third tab, Component Predesign, is the one where users will be required to provide detailed technical information on all system components, such as sorption chiller, solar collector an its orientation, storage tanks and heat rejection as well as backup systems (see figure 2). The temperatures for different applications need to be set here as well. 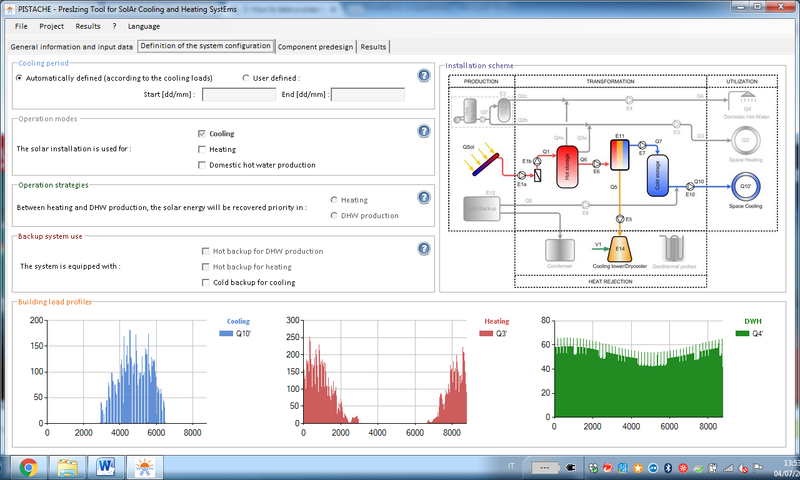 The Results tab will then show the energy balance for one year (see figure 3), including a summary of hot and cold storage efficiency, thermal COP (coefficient of performance), primary energy ratio, net solar productivity, overall solar efficiency, electric COP, collector yield and the cost of the energy produced (EUR/kWh). Users can also have these results displayed in more detail as part of a monthly balance. A detailed sensitivity analysis was employed to scientifically validate PISTACHE, and the findings of this analysis were published in 2013 (see the attached paper). The tool results can be exported to Excel or other, similar programs. One limitation of the tool is that users cannot compare differing system configurations. These kinds of comparisons will have to be done manually by putting two Excel spreadsheets next to each other. The article was written by Riccardo Battisti, a solar thermal consultant and market researcher working at Ambiente Italia in Rome, Italy.